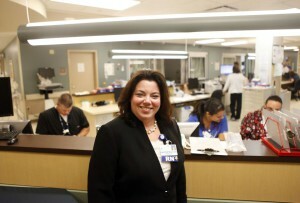 What is a Chief Nursing Officer? Professionals who are currently in the nursing or related profession seeking to advance may wonder what is a chief nursing officer. A chief nursing officer, commonly referred to as a CNO, is one of the highest positions in nursing management. He or she organizes and manages a healthcare entity’s nursing department and its everyday operations. He or she is also the main spokesperson for all nurses within the organization. A chief nursing officer’s primary objective is to ensure the standards of patient care are carried out. He or she works with other management professionals to implement the best practices in nursing care to make sure patient needs are effectively met. He or she also coordinates recruitment and training of new nurses and establishes benefit and compensation programs for employees. Many CNOs also help create patient-care programs, plan new services, oversee nursing budgets, and develop and implement new nursing policies. A CNO often represents nursing services at board of director meetings as well as within the community. CNOs commonly oversee multiple nursing departments within in an organization. They supervise nurses, managers, and other staff to implement and facilitate patient care and policies. A common goal for chief nursing officers is to establish a positive, collaborative nursing environment that not only provides exceptional care to patients, but also meets the needs of nursing staff. According to the National Student Nurse’s Association, the majority of chief nursing officers generally begin as registered nurses within a medical facility or organizations and work their way up to leadership positions. Upper-level nursing roles typically require at least a bachelor’s degree in nursing, but the standard for majority of CNO positions is a master’s degree in nursing. Chief nursing officers must also have broad clinical nursing and management experience. Individuals working as CNOs must have a solid understanding of the operations of the healthcare organization. They must also have a working knowledge of current trends and changes in the healthcare field as well as regulatory standards at the state and federal levels. The essential qualities of these professionals include outstanding leadership and mentoring abilities, strategic thinking skills, keen problem-solving skills, flexibility and able to adjust to change, and strong communication skills. The yearly pay of chief nursing officers greatly varies by healthcare organization, location, and experience, but the median salary is around $112,000 per year. The top 10 percent earns above $170,000 and the lowest 10 percent earns below $78,000. Like other executive professionals, CNOs are commonly entitled to incentives and bonus earnings that can raise their overall salaries. The career outlook for chief nursing officers is positive, due to the rapid growth in the nursing and healthcare field. The Bureau of Labor Statistics expects executive positions in nursing to grow faster than average for all professions. Registered nurses with advanced education and extensive leadership and management experience will have a competitive edge for executive and management opportunities. As the healthcare field becomes more complex, the need for strong executives is essential in all types of healthcare organizations. Pursuing a career as a chief nursing officer is an ideal choice for experienced and highly education nurses seeking to play a significant role in both a healthcare organization as well as the community.